Bioinformatics began from our requirement to understand how life works, which is precisely why DNA is so important to bioinformatics. DNA sequencing and research have progressed over the years, ultimately leading into the field of bioinformatics. If you think about DNA and its enormous control over life, you can understand how it has many roles such as coding for genes and comprising the biological substance of humans and other living organisms. The aim of bioinformatics is to reveal all of the information that is somewhat veiled under all of this structure, sequencing and general data. Bioinformatics ultimately seeks to gain a clarity and understanding of the very basic biology of organisms and to then utilise this understanding to improve our own lives. Bioinformatics involves applying computer technology to the handling and sorting of biological information. As such, we can use computers to analyse and make sense of this biological information. In a sense, bioinformatics is a bridge between the biological sciences and computer sciences. With so much information, bioinformatics can let us detect valuable data contained within enormous volumes of biological information. Once uncovered, this information can be applied to technological applications in fields such as medicine, agriculture, environmental sciences and nutrition. Bioinformatics is important to a virtually unlimited number of fields. However, one of its biggest challenges is to obtain clarity within the massive amount of information that results from projects involving the sequencing of the human genome. 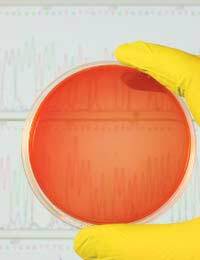 Initially, this type of sequencing was performed solely in the laboratory but with such an enormous level of data production, we now rely on computers to accomplish sequencing goals. To actually generate a DNA sequence and then store and analyse it, computers are responsible for much of the work. However, it is a challenge in bioinformatics to efficiently and successfully store such a large volume of data and to do so in such a way that a scientist can easily access the necessary information as needed. Data in itself is almost useless until it is analysed and correctly interpreted. To handle so much data, computers are important to fill this vital gap, which can aid scientists in the extraction of useful and important biological data. Bioinformatics is used in many aspects of medicine and will likely continue to grow as we find new capabilities and applications. It has the potential to create custom medications, prevent or treat disease, benefit the environment or support agricultural technology. In molecular medicine, we can obtain a higher number of drug targets through the use of bioinformatics. Another important area is that of gene therapy, which is a particularly strong focus of research at present. In agriculture, bioinformatics can allow us to enhance the nutrient quality of foods and develop crops that are able to handle poor soil growing conditions and bad weather. We can also develop our understanding of evolution through bioinformatics as well as broaden our understanding of environmental issues such as climate change. Clearly, bioinformatics is a significant area of science and it will continue to develop and support our research and understanding of DNA and the biology of organisms.